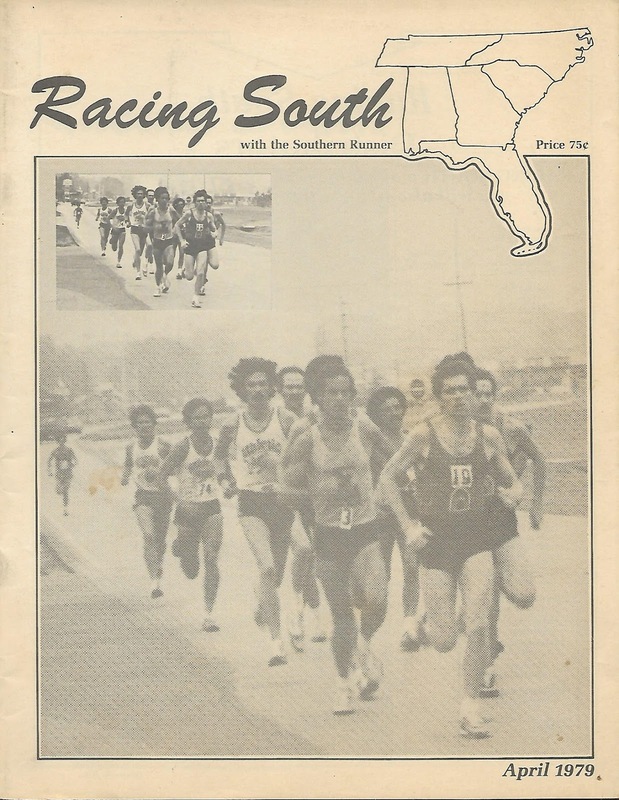 runjoey: Racing South/Carolina Runner/Running Journal Grand Prix Series. Racing South/Carolina Runner/Running Journal Grand Prix Series. 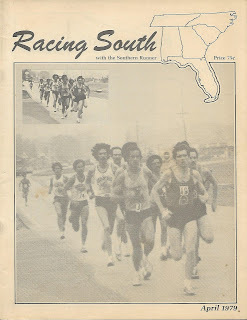 Shortly after I began racing in March of 1978 I found a regional magazine, Racing South which covered 6 states in the Southeast, NC,SC, GA, TN, AL and Florida. 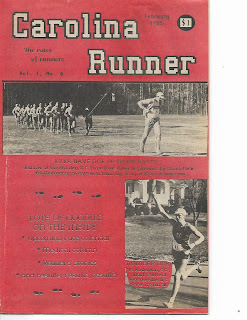 It was a running magazine with a heavy emphasis on, well racing ! The magazine was based in Florida and started by Mike Caldwell. One of the features was a yearly Grand Prix series of races in the states covered where runners would earned points based on the finishing position. I assume it was one of the earliest GP series in the country for runners. In those first few years it only had the open division for men and women in a schedule of about 15 races. After several years they did add a masters division and by 1986 added Grandmasters but still no seniors. In that era most races didn't include age groups over 40 and a few larger ones over 50. I remember at Maggie Valley 5 Miler which was a pretty big race in the those days, my mother won an award for being the oldest finisher on the day she turned 50. A happy birthday. Ok, back to the story. 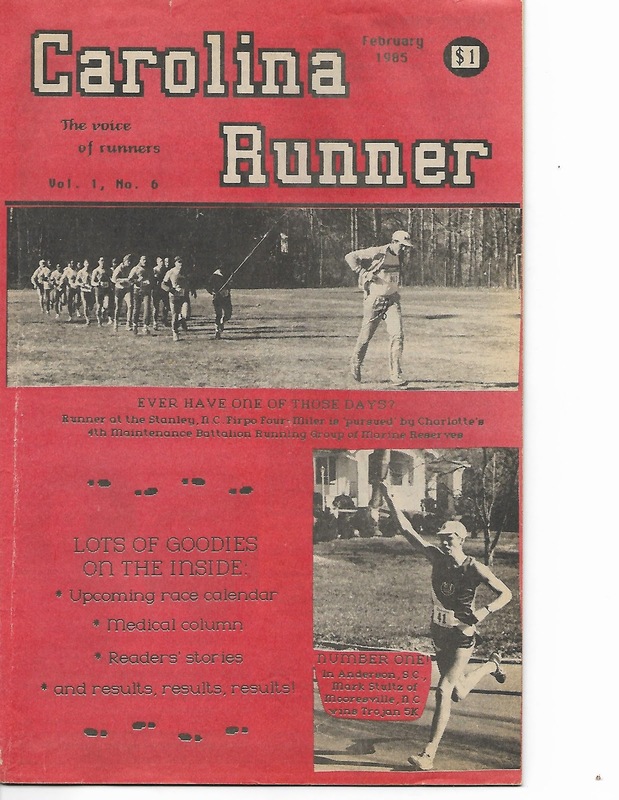 In 1984 while I was at a Labor Day race in Durham I was handed a small magazine called Carolina Runner. It was the first issue and covered just NC and SC. The magazine was started by Bruce and Julie Morrison. The significance of this is that they bought and merged with Racing South around 1987 and changed the name to Running Journal. Fortunately they continued with the Grand Prix Series which is now in its 40th year. Over all those years I just by chance ran in a few races on the circuit but never earned any points that I can remember and made no effort to join in any races because they were in the series. Of course over most of the past 20 years I have concentrated mostly on triathlons and then ultramarathons and the series was just a curiosity to me as a subscriber over all these years. But then a couple of things have come together. My recent return and focus on shorter races along with the fact that I too I'm entering my 40th year of racing made it an easy decision to make my biggest goal for the next 9 months to compete and attempt to win the Senior Grandmasters division ! Ultras will have to wait awhile longer. None of the races from the original series are still on the schedule which has changed almost yearly and has fluctuated between 15 that first year to 8 currently on this years. There are several that have been on there for around 30 years or more though including the kick off race, the only marathon and the final race. Hmm, several trips to Alabama which I have never been to by the way. I've been lucky to have my picture in magazine a couple of times over the years, quite by accident. The year I ran my double Grandfather Mountain Marathon the editor was looking over pictures for the event and choose one of me and my former training partner on the track in our kilts to feature in the magazine. I emailed her and explained the significance of that photo and the story behind it and so she did a story on me a month or two later. On another occasion I was in a picture Teri Saylor took for one of her monthly columns in the magazine. If all goes to plan next Summer I hope to be on the cover as series winner ! I hope to run in most of them as time and money allows. The competition could be very tough as there are some serious runners competing in several of these races but I hope to make a good showing. I'm not quite back to 100% of the condition I was before the injury in February but if things continue to improve by the 2nd or 3rd race into the Fall I hope to be back in top form. I head down to Anderson SC tomorrow for the Friday night event which actually begins at 10pm, not midnight by the way. It's a hilly course and will be still quite warm and humid so not sure what time to expect. I'll just give it all I have and see how it turns out. I did see that the total elevation change is practically identical to the NCRC Classic 10 in Umstead which I won in 2016. Stay Tuned for results and updates and thanks for following along on my latest adventure !